THE SON OF GOD- LIVE AND IN PERSON! 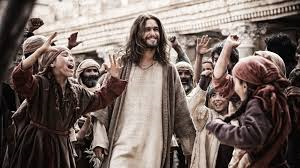 Have you seen the Movie, “The Son Of God” yet? We at The Lighthouse Church bought out every seat and hosted two sold out showings of the film at Frank’s Theaters in Rio Grande last week. I have to tell you that there is something very emotionally moving about seeing what Jesus and his earthly life and ministry could have been like in a visual manner. At the end of the presentation, nobody in the house moved for a while and normally people are rushing to the exits as the credits roll. Not this time. Not after seeing what we all saw on the big screen. Nobody was going anywhere in a hurry because you just had to have an extra moment or two to properly process what we all had just been through. It makes it even more meaningful especially when you know that Jesus chose to go through all of what he did for us human beings. Greater love has no man or woman ever bestowed upon us! The danger is that we have all heard the story of Jesus so many times that we become to anesthetized the potent power of this extraordinary person. Also, way too often, we fall into the trap of ignoring or even totally removing the everyday humanity of our Lord when we only encounter him in church settings. For example, after viewing The Son Of God, someone mentioned that they were disappointed that Jesus cried out in pain when the nails were driven into his hands and feet. Are you kidding me? What did they think? Did Jesus have a specially branded body that never got hurt? Did he not cry as a baby? Did he not groan and moan when his body betrayed him as we do in our own packaging? I just shook my head wondering what kind of response that they would have made if they had experienced the same thing Jesus did. And if we all had the “Get Me Out of Here” clause that was available to our Lord although he never used it- how many of us would have persevered and endured the cross, facing the pain and the shame only for the joy of bringing people like us into an eternal relationship with the Father? It sure makes you think, doesn’t it? The other comment I kept hearing over and over again was that Jesus looked too pretty. I am not really sure what that means. What did they want- an ugly standoffish Savior? Did they want somebody more cold and calculated like the Chief Priest and the Pharisees? I love the fact that Jesus will reach out to us nobodies! This is what made him so unlike any other religious leader of that day or any other mind you. I do know that whoever encountered the compassionate Lord in the Scriptures always felt loved and cared for in a way that they had never known before. Too much holier than thou and not enough we are all in the same boat scenarios happening in our churches today! Maybe that is why the same Jesus who didn’t fit in then, might find the same cold shoulder offered him if he came back to our congregations today! Now, under normal circumstances, only the men would be allowed an audience with the Teacher. Women and children were only background players and circumstantial noise. But the children sense that this man is kind and loving. They beg to go and see the Rabbi who some call a prophet and even some, the Messiah. The mothers eagerly gather their little ones in their arms as the older brood run ahead. All of a sudden, parents begin to blush in embarrassment as some of the disciples give the young people a tongue lashing. “Don’t bother Jesus!” they warn and they even add a “Why don’t you control your kids?” for good measure. Jesus’ apostles attempted to shoo the children away. But Jesus hears the squeals of laughter, and doesn’t miss a beat. Calling out clearly Jesus says, “Let the children alone and don’t you dare prevent them from coming to me.” And then He makes a lesson out of it for those who so often push the children away, “God’s kingdom is made up of people like these.” Then He gathers the children around Him, and one by one he touches each little head, even holding some of the babies who are fussing because they’re hungry or need a nap. And then He prays over them, pronouncing God’s blessing on the children. It makes me wonder that if you were one of the mothers or fathers in the crowd that day, what would you have wanted Jesus to say as He touched your child? What words of blessing would you have wanted our Lord to give? Would it have been a prayer for a healthy long life or for happiness and comfort or for good friends and a close family or for a noble character and reputation or for wisdom or to be cherished and loved or for an eternal close relationship with God? What blessing would you have wanted Jesus to pronounce upon your child if He would have put his hand on them that day? The key ingredient here being that Jesus would have given your child the undivided attention that too many times we are too distracted to offer! Jesus always cuts us right to the heart of the matter. I challenge you to look at Jesus through eyes other than those that have been prejudiced by stain glass. Look honestly at Jesus. Look openly as a seeker would. Come to him and let him be as he is and not as culture has molded him to become. See if Jesus doesn’t rock your world and set your heart to experience what nobody else could ever evoke from within you. I just fear that too many people are walking away from the imposter Jesus and not seeing the Son Of God that the writers of the gospel like John and the others wanted us to know. Taste and see that the Lord is good. You might just discover that one helping of God is never enough!